H.P. Lovecraft is one of my favorite authors. My dad gave me a few books probably five years ago, and while I enjoyed them at first read, they have grown on me quite a lot and I have reread some of the stories dozens of times. This particular book is a "best of" collection, though as is often the case with such compilations, it is missing some of Lovecraft's best stories and there are some questionable inclusions. I also had a few other books, however, so I did not miss out on any of his best work due to some incompetent editor. 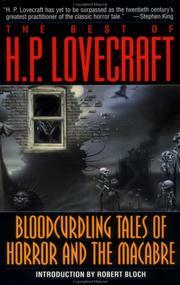 Lovecraft writes in a style that is archaic and scholarly, making it difficult for some to like, or even comprehend. Ten-dollar words are used liberally in rather long sentences, and one's vocabulary will be stretched by the sheer amount of negative superlatives he packs into every story. There isn't a situation he writes about in which there isn't something eldritch, indescribable, abhorrent, ghastly, grotesque, insidious, fearsome, or just plain terrifying. Most horrible of all sights are the little unpainted wooden houses remote from travelled ways, usually squatted upon some damp grassy slope or leaning against some gigantic outcropping of rock. Two hundred years or more they have leaned or squatted there, while the vines have crawled and the trees have swelled and spread. They are almost hidden now in lawless luxuriances of green and guardian shrouds of shadow; but the small-paned windows still stare shockingly, as if blinking through a lethal stupor which wards off madness by dulling the memory of unutterable things. That story is only six pages long, but imagine maintaining that kind of momentum through fifty pages in "The Shadow Out of Time" or a hundred in "The Mountains of Madness." It's kind of a marathon sometimes, but often have I found myself battling my drowsiness at 3 AM just so I can read the last chapter of "The Thing on the Doorstep." The breadth of scope he is able to use is impressive, too: some stories are told entirely in a bar to a friend, regarding the possibly unholy inspiration in a local painter's work, while others cross thousands of years and miles, addressing cosmic horrors and the danger of total destruction of the human race. Unfortunately, his work was dreadfully underappreciated when it was published in the late 20's, and he ended up dying at 46 in poverty and obscurity. Don't make the same mistake the 20's did! This is some seriously good literature, and besides, shouldn't everyone read the original "Re-Animator"?